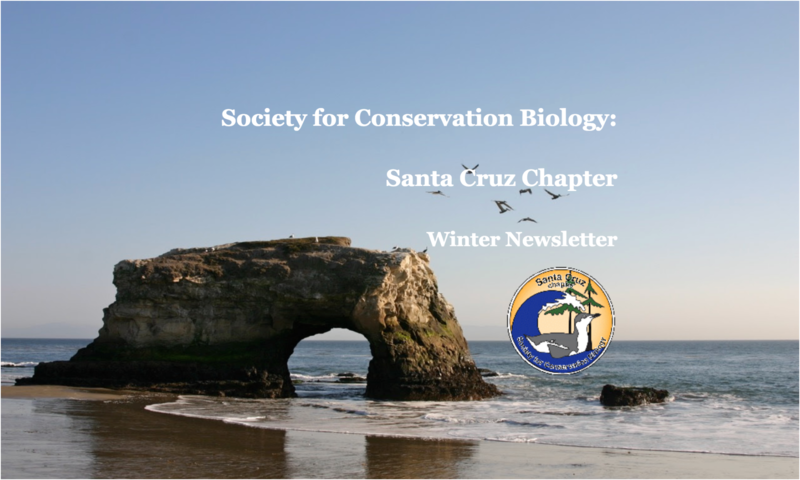 The 2017-18 school year has wrapped up at UC Santa Cruz, and we at the Santa Cruz chapter of the Society for Conservation Biology are excited to reflect back on the events we’ve hosted over the past year! 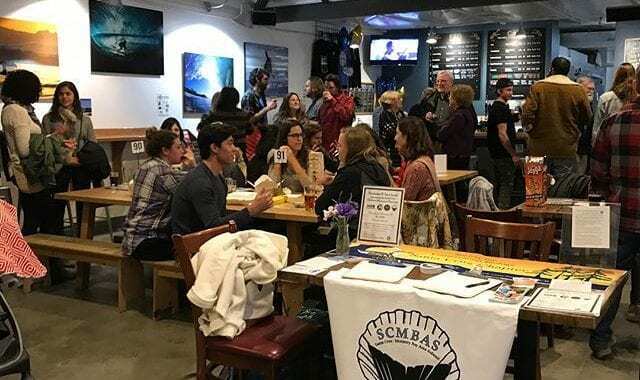 In February, we co-hosted a fundraiser to benefit the Santa Cruz Children’s Museum of Discovery (MOD) with UCSC’s Women in Science and Engineering and the Santa Cruz and Monterey Bay Area subunit of the American Fisheries Society. It was a great opportunity for both members of these university groups and the community to come out to support this wonderful educational resource! East Cliff Brewing donated $160 in proceeds from the evening, in addition to individuals’ direct donations to the MOD. 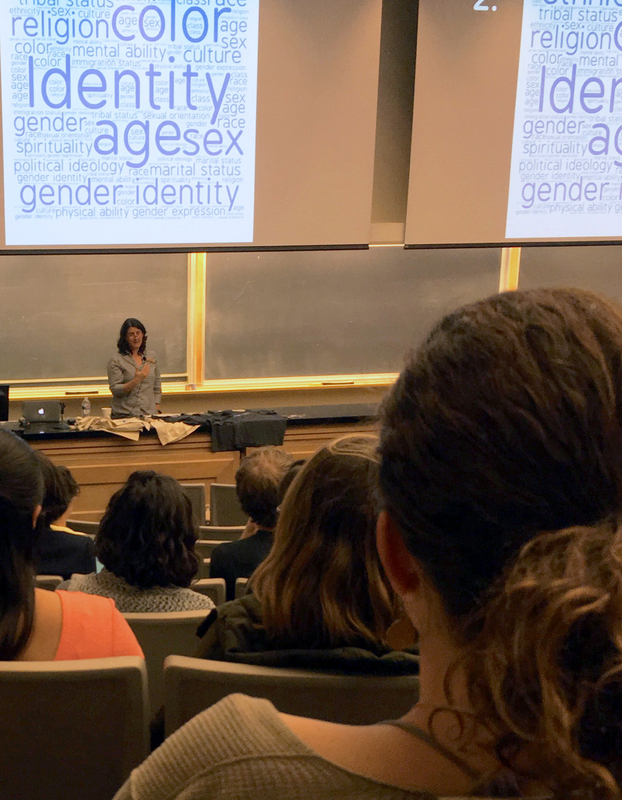 We also hosted a three-panel discussion series on various topics on diversity in conservation. These panels were funded in part by the UCSC Office of Diversity, Equity and Inclusion, and the Ecology and Evolutionary Biology and Environmental Studies Departments. We are thrilled by the success of these panels, panelists and audience engaged in meaningful and informative discussion during all three events! Our first panel, “Diversity and Inclusion in Conservation Science,” featured speakers: Rolando Madrid (Director of Programs at SACNAS), Erika Zavaleta (Professor of Ecology and Evolutionary Biology here at UCSC), Justin Cummings (Director of the UCSC Doris Duke Conservation Scholars Program). 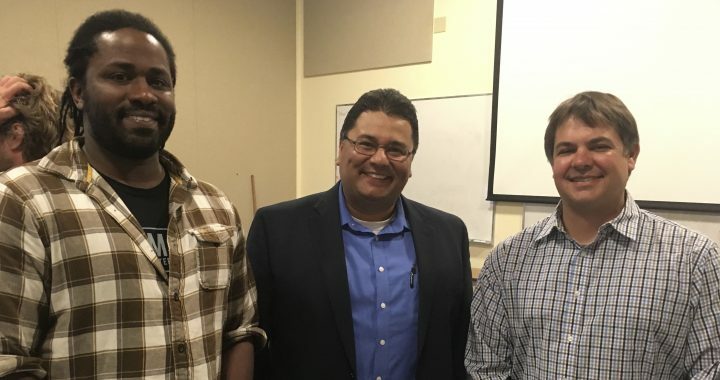 The speakers described their own routes to careers in science and science advocacy, and discussed social and institutional barriers that high school and undergraduate students from underrepresented groups face in pursuing careers in conservation. Matching students with mentors, even when it means from a different field or university, can make a major difference in keeping students interested in conservation in the field. 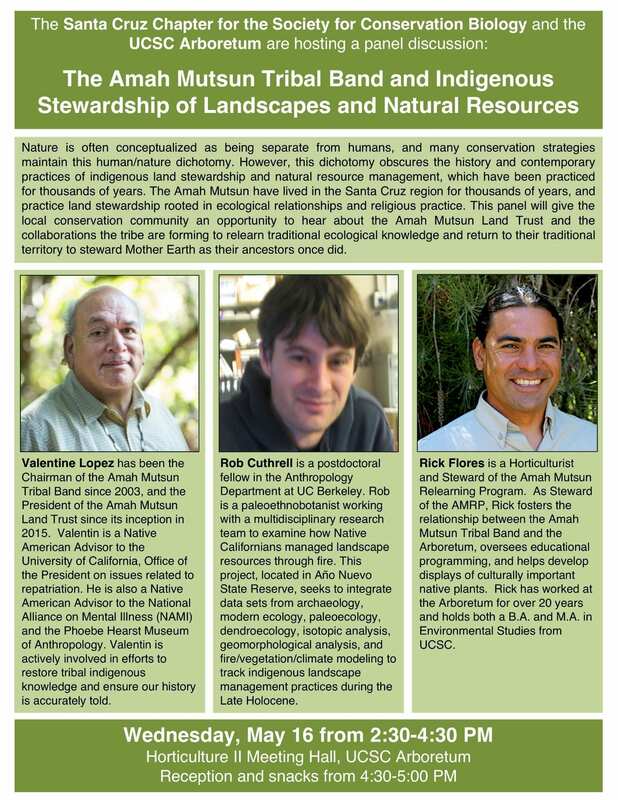 The second panel, “The Amah Mutsun Tribal Band and Indigenous Stewardship of Landscapes and Natural Resources,” featured speakers Valentin Lopez (Chairman of the Amah Mutsun Tribal Band), Rob Cuthrell (Postdoctoral researcher in Anthropology at UC Berkeley), and Rick Flores (Horticulturist and Steward of the Amah Mutsun Relearning Program). 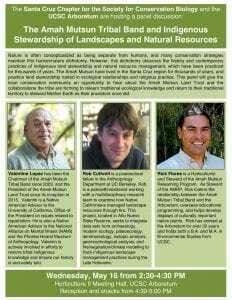 Panelists gave a brief history of Amah Mutsun and other Native American groups in the Santa Cruz region and described historic and contemporary Amah Mutsun land stewardship practices. Panelists also discussed the activities and goals of the Amah Mutsun Land Trust and the collaborations the tribe is forming to relearn traditional ecological knowledge and return to their traditional territory to steward Mother Earth as their ancestors once did. unpaid research opportunities and paid ones, the NSF REU program in particular. As each panelist spoke about their professional experience, the importance of mentoring and developing professional networks emerged. 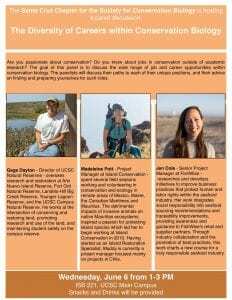 In the upcoming year, we are excited to announce that we will be partnering with the UCSC Arboretum to host conservation talks aimed at the general public, and look for SCSCB-provided articles on science and conservation in the Arboretum’s quarterly newsletter! SCSCB has a new newsletter! We are very excited to announce our new quarterly newsletter! It will include announcements about upcoming conservation talk, local conservation events, and feature local conservation groups. Subscribe here! 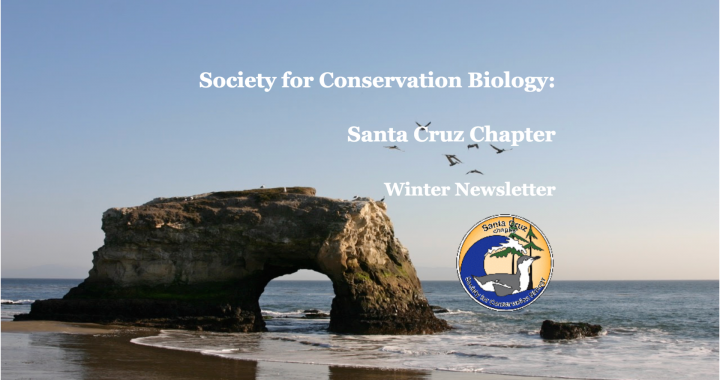 Welcome to the first newsletter from the Santa Cruz Chapter of the Society for Conservation Biology! The SCB is an international professional organization dedicated to promoting the scientific study of the phenomena that affect the maintenance, loss, and restoration of biological diversity. Our chapter’s mission is to promote the application of science in solving conservation problems and protecting biological diversity in our community. Follow our brand new Instagram page @santacruzscb and like us on Facebook! Geocaching Adventures on the Coastal Science Campus! Learn about larval fish while searching for 5 caches around CSC! 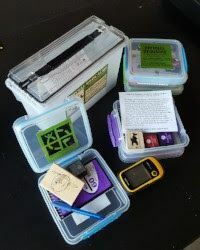 Geocaching is a GPS-based scavenger hunt in which participants search for hidden containers. Kat Dale, a graduate student in the Mehta Lab, and the Seymour Marine Discovery Center have hidden 5 caches around the Coastal Science Campus. Caches went live February 26th! 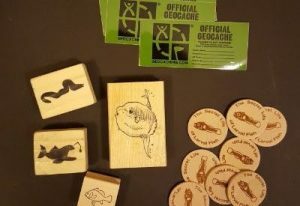 Pick up a “passport” for the caches at the Seymour Marine Discovery Center. Find a cache around the Coastal Science Campus (5 total). Answer a specific question about larval fish that is associated with each cache. The information needed to answer the cache is hidden inside the container. Receive a commemorative coin at the Seymour Center after finding and collecting all five cache stamps! 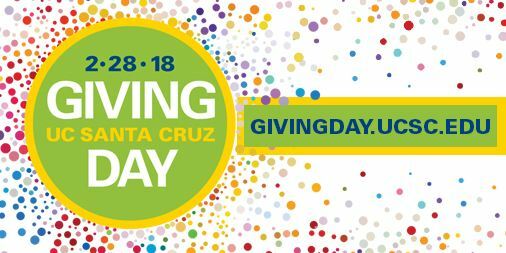 Giving Day is an energized 24-hour giving drive to support students, staff, and faculty initiatives. Please help support the Santa Cruz Chapter of the Society of Conservation Biology. Giving Day donations have now closed. Watch a short video below to learn more about our group!! 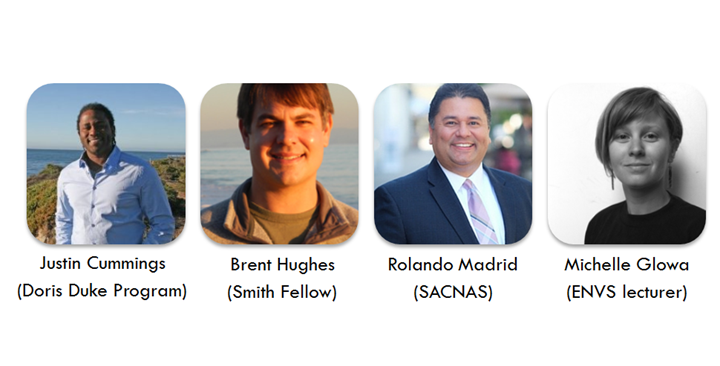 Join us for our panel series during spring quarter! 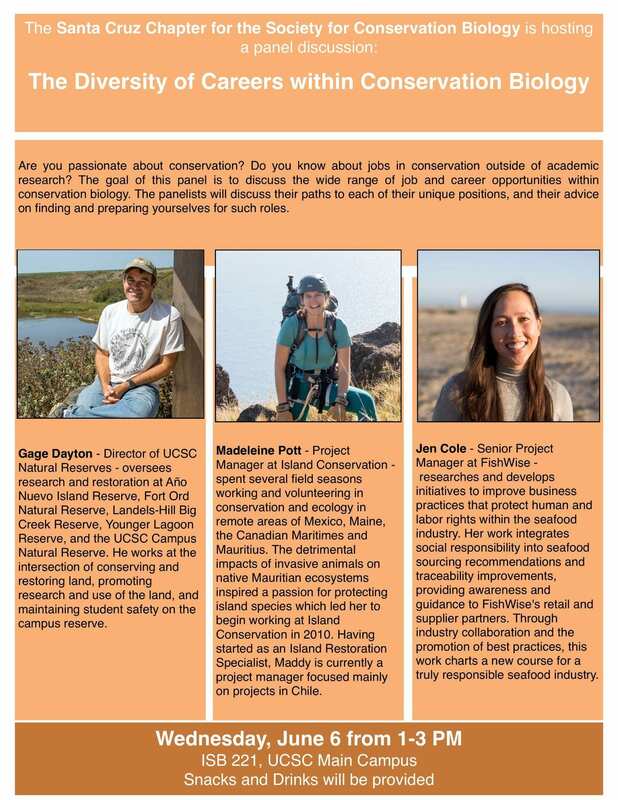 The panel series will address the pluralism of ideas surrounding conservation including: (1) diversity and inclusion within conservation science, (2) alternative approaches to conservation practice beyond the dominant paradigm, and, (3) conservation careers beyond academia. 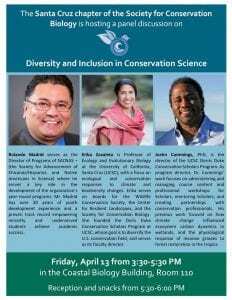 Our first panel in this series, Diversity and Inclusion Within Conservation Science will take place on April 13th 3:30-5:30 in CBB 110! This panel will focus on how identities including race, gender, class, etc., can impact a person's ability to participate or engage in the field of conservation science, and what we as a field can do to address these issues and support students and scientists from marginalized groups. 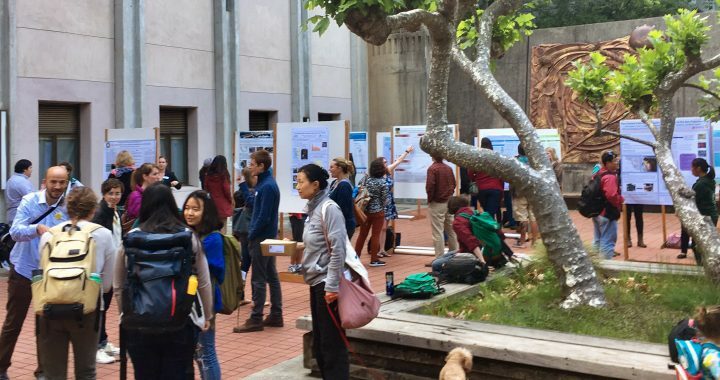 This past May, the Santa Cruz chapter of SCB had the opportunity to host the 18th annual Bay Area Conservation Biology Symposium (CBS) here on the UCSC campus. This was particularly exciting for us, since it was the first time the conference was hosted in Santa Cruz! 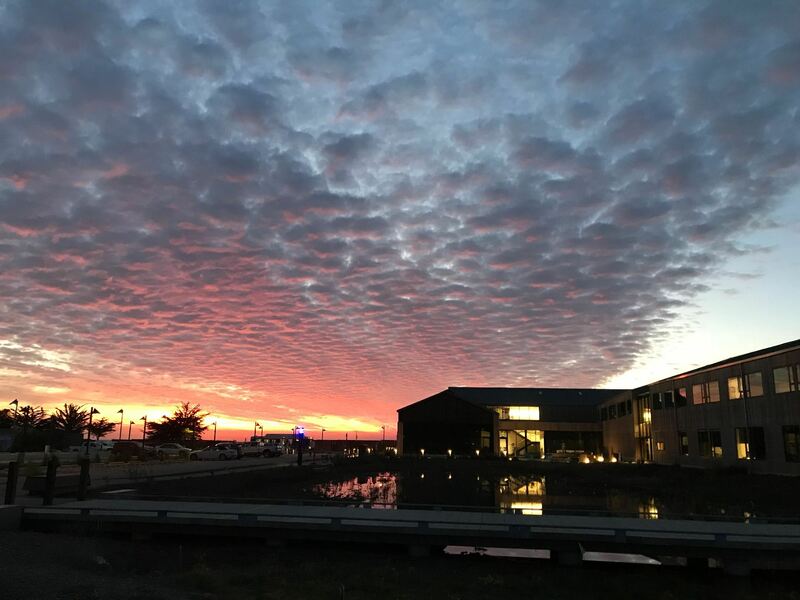 The Bay Area Conservation Biology Symposium is meant to bring together researchers and professionals working in conservation all over the California Bay Area. 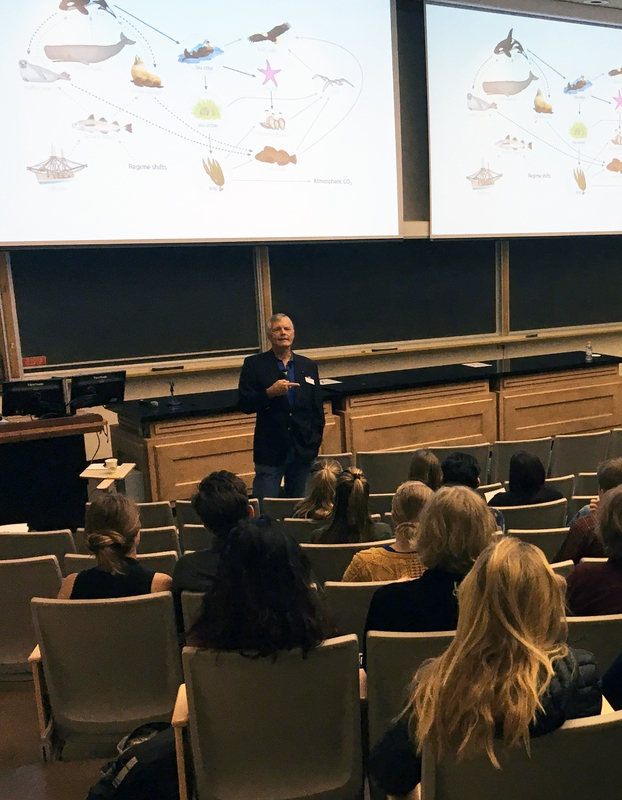 With 150 registrants, we played host to a diverse array of students, professors, researchers, as well as professionals working in wildlife management and at conservation non-profits! Participants came from University of California Berkeley, Davis, and Santa Cruz campuses, Sacramento State University, Santa Clara University, Stanford University, and non-profit groups such as Island Conservation, Pathways for Wildlife, Golden Gate National Parks Conservancy, San Francisco Bay Bird Observatory, the Greater Farallones Association, and the Doris Duke Conservation Scholars program to name just some organizations! 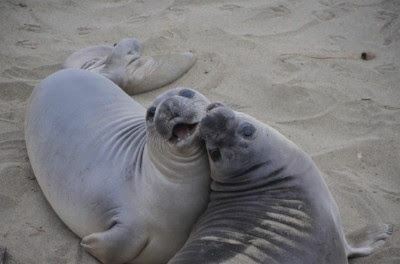 Our esteemed keynote speakers, Dr. Jim Estes and Dr. Karen Poiani, come respectively from the worlds of academic research and applied conservation, and both are based out of lovely Santa Cruz! 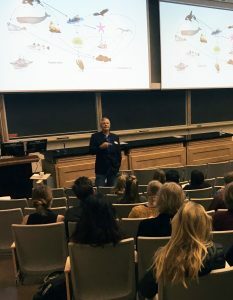 In Estes’ talk “Ecology and conservation biology: a 50-year retrospection on change,” he described changes in the field of conservation biology over the last 5 decades through the lenses of motivation, values, participants, and technology. He extolled students to look both forward and backward in their pursuit for conducting effective and relevant conservation research. 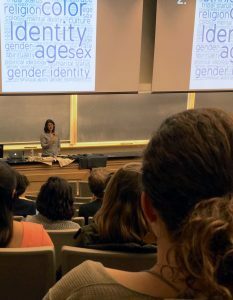 In the afternoon, Poiani shared her wisdom from her years of experience with the Nature Conservancy and now as CEO of Island Conservation on the importance of empathy and human engagement in conservation practice in her talk, “What will it take to be a Conservation Action Hero in the Anthropocene?”. A shared theme between the two talks was increasing equity among conservation the future of conservation. In addition to the two keynote addresses, this year’s CBS also featured 37 research presentations, 20 research posters, as well as a new addition: an expert panel on environmental law, “Law in the age of deregulation,” featuring Nicholas Whipps (moderator), Jenny Loda, and Dr. Tim Duane. 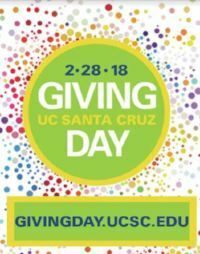 This event was made possible by support from Society for Conservation Biology, UCSC’s Graduate Student Association and Ecology and Evolutionary Biology Department, and UCSC Giving Day donors. We would also like to thank all our presenters and attendees, without whom there would have been an event! 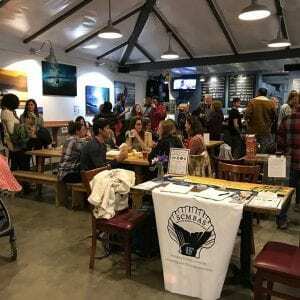 After the symposium, some attendees joined us for a celebration at Equinox Winery, where 20% of proceeds from the evening went to the Peninsula Open Space Trust. It was an inspiring day! We’re all looking forward to the upcoming 2018 Conservation Biology Symposium, and we hope to see all our friends there! 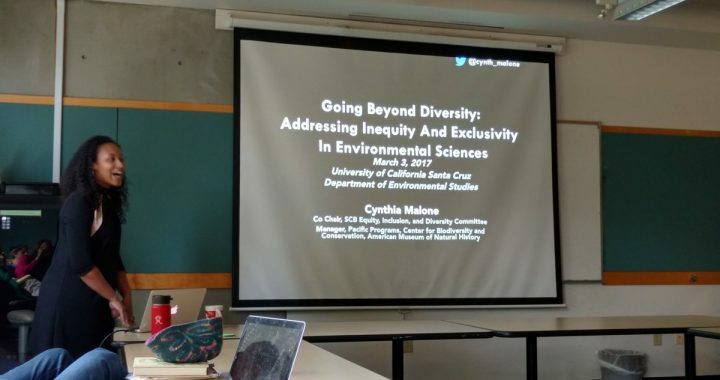 On March 3, we heard from co-founder and co-chair of the Society for Conservation Biology’s Equity, Inclusion, and Diversity Committee, Cynthia Malone, in her talk, “Going Beyond Diversity: Addressing Inequity and Exclusivity in Environmental Sciences“. Cynthia discussed the historical context of human-environment associations, particularly how the environment has been used as a form of violence against African American individuals and communities. She shared her vision for going beyond promoting diversity in the environmental sciences by also focusing on inclusion and equity. She stressed the importance of validating diverse backgrounds, experiences, and ways of knowing in our field. Cynthia encourages us all to go beyond our historical understanding of conservation to include addressing environmental injustice and environmental racism in our work. Thank you Cynthia for sharing your research, work, and insights with us! If you want to follow more of Cynthia’s work, you can check out her twitter handle @cynth_malone. If you missed Cynthia’s talk, check out the Storify below, with live tweets from SACNAS! 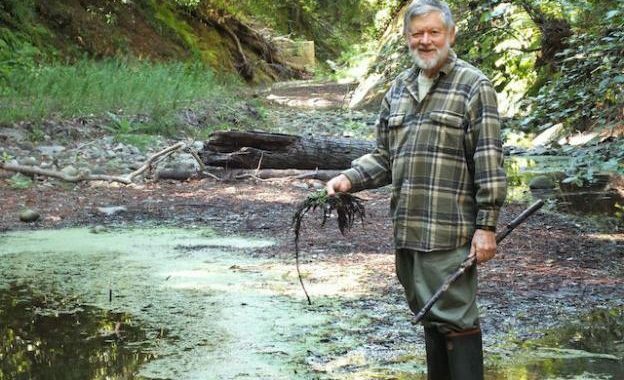 Fred McPherson organizes the Santa Cruz Mountains Institute and is a Board Member with the Santa Cruz Mountains Bioregional Council. He wrote the following descriptions of both organizations and, after those, read his latest blog…which he issues regularly on solstices and equinoxes. The The Santa Cruz Mountains Institute is a loose-nit group of past students from my classes about the Field Studies and Natural History of the Santa Cruz Mountains and the San Lorenzo River and other friends interested in the natural history and resource management issues of the Santa Cruz Mountains. I send out a little news letter and/ or announcements about what I am doing and things of interest now and then. The idea of starting an Institute started when Paul Niebanks was chair or the Environmental Studies Department, or Board back in the 1980s We not only had Santa Cruz Mountains Field studies program back then that John Stanley and I were involved with, but Paul also had on going classes and seminars about resource management and planning going on during the school year that I was a part of. 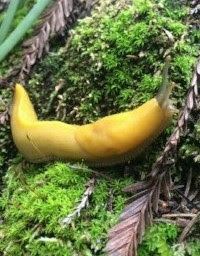 Any one interested in the natural history and resource management issues of the Santa Cruz Mountains can be a member and receive the e-mail newsletters and contribute by staying in touch with me by e-mail (fredwood@cruzio.com). The summer solstice has come and gone and summer is officially here. We are starting to get back into our traditional pattern of alternating summer fog and hot spells, and the tan oaks are blooming, adding their characteristic fragrance to the summer air. This summer the hot spells seemed hotter, like the weather in the last days of June, and wetter and more drippy in the beginning foggy days of July. The last days of June were in the high 90s F. here in the second-growth redwoods of Boulder Creek and over 100°F in town. Also for some reason, it has been one of our best thimble berry and hermit thrush years in decades. Most of you know the discouraging news that 2015 was the hottest year in recorded history and each month continuous to set records, with May being the hottest May in history and I just heard that June was also a rcord-breaking month. I still believe that global climate change does change everything and it remains the most urgent environmental challenge of our times. I know that many of you are involved in this crucial issue and I welcome hearing about what you are doing. In addition to the ongoing changes that I am making in my own lifestyle and home, I am still a member of the San Lorenzo Valley Water District (SLVWD) Environmental Committee and we are working on various ongoing water related environmental issues including how to reduce our carbon footprint further by generating more of our own electric power. In addition to possibly adding more efficient new solar panels, Director Gene Ratcliffe and the committee are investigating the possibility of small-scale hydroelectric energy generation. I also remain involved in the surface and groundwater politics of Santa Cruz County and the San Lorenzo River. Water and energy use are so interrelated. My wife, Roberta, and I are in the home stretch of finishing the Fall Creek video that we started in the Spring of 2015. We received an educational grant from the San Lorenzo Valley Water District to make a video about Fall Creek and where the community of Felton gets its water. As we have gotten into the project, more and more mysteries and information have serendipitously emerged. We knew that the community of Felton got its high quality cool water from Fall Creek at the intake pond just below the entrance to Fall Creek state park, but where does Fall Creek get its water? 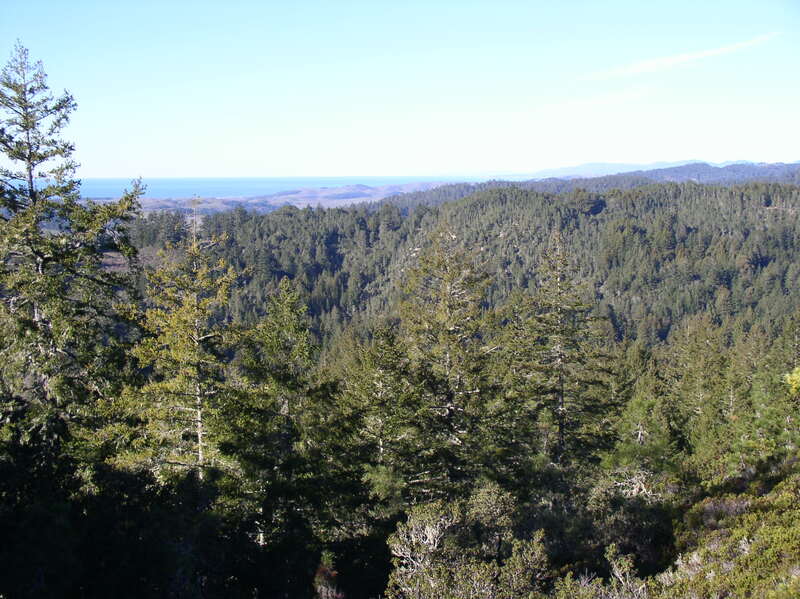 In our Santa Cruz Mountains Bioregional class we have learned that Ben Lomond Mountain is one of the three main ridgeline geographic features of the Santa Cruz Mountains. 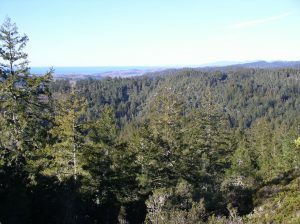 Ben Lomond Mountain, along with the Butano Ridge and the Skyline Ridge, form the three main NW/ SW ridgeline axes of our Outer Central Coast mountain ridge. But what is special about Ben Lomond Mountain is its unique geological history. In the last few million years it has been uplifted and tilted to the southwest along the Ben Lomond fault, but its core is the igneous Salinian Block. It is believed to have had its origins in the Southern Sierra Nevada and has been broken off and brought up to the north along the western side of the San Andreas fault system. It brings with it a unique geological structure of igneous granite and quarts diorite as well as overlaying sedimentary and metamorphic rocks and Karst landscape materials that have a role in the formation of the Fall Creek watershed and its clear, cool waters. I’d like to thank institute members Bryce Winters, Jane Orbuch, Daniel Williford, and Frank Perry for their help on this project so far. Also thanks to David Grant from the SLV High School Aquaculture program, Dave and Annie Weise at the confluence, the SLVWD staff, and Drone pilots Dylan Arndt, Zoe Stumbaugh and Allan Lundell for their help. There are legitimate concerns about the use of small drones from a personal privacy and wildlife/resource management point of view, but I have learned that there are many real potential useful roles that responsible drone use can play in natural history and resource management. The Santa Cruz Mountain Bioregional Council is investigating policies about their use. We plan to have public showings of this video for the community and schools after it’s completed in late summer. Let me know if you have suggestions of where and how to share it. I will let you know about these events as plans develop. In addition to the ongoing fun and adventures associated with my home, family and community life this last winter and spring, I have kept up my natural history hikes, classes, and activities for Carol Carson’s SLVWD Community Education Grant Watershed Walks, Henry Cowell State Park Docents training program, and the San Lorenzo Valley Museum. After nearly a decade of Carol’s Community Watershed walks, they are coming to an end due to lack of ongoing funding. I think they have played an important role in educating our San Lorenzo Valley community about the natural history and dynamics of the watershed. I hope that another way can be found to continue this important form of community environmental education. Thanks Carol, as you and Bucky walk off into the sunset, for all of your dedicated work over the years. “Species Acounts Animals” in the library and the instructions for using them are in the front of each door. There is a wealth of unpublished (grey liturature) information there and if you want to access it for your interpretive or research purposes, you can make arrangement with the acting interpretive naturalist. In the July-Sept. 2016 issue of Bay Nature there is a feature article written by Joan Hamilton about the bold new plan for the redwood forest of the 21st Century that is being forged in the Santa Cruz Mountains. It is a timely article that explains some of the issues involved with land acquisition, management, and conservation of the redwood forest in the Central Coast Range in this new economic era. For decades, the specter of redwood forest destruction and urbanization has stimulated donations to the conservation of redwood forests. But now, partly in response to economic austerity conditions, the land conservation organizations for redwoods, like the Sempervirens Fund can no longer purchase the redwood land they wish to conserve and simply turn it over to the State of California. 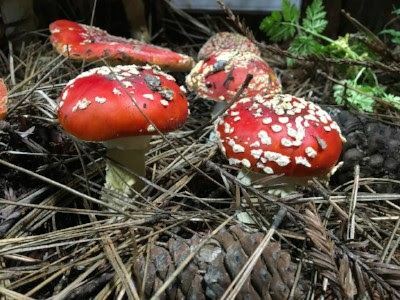 They now are forced by economic restraints to hold these critical newly acquired properties and engage in their own version of redwood research and resource management. 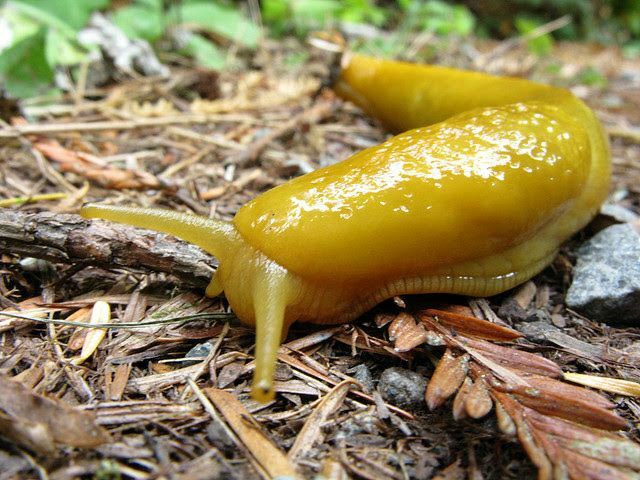 This article explains how the coalition of Sempervirens Fund, the Peninsula Open Space Trust(POST) and the Save the Redwoods League are attempting to collaborate to develop a management plan for the newly acquired 8,532-acre San Vicente watershed redwood forest lands. Lands are proposed to be divided into Restoration Reserve Forests, Working Forests (that will be thinned) and Preservation Reserves. How will these lands be managed? Check out this article. Also in this issue there is a very sweet article entitled “Malcolm Margolin’s Beautiful Life,” well worth reading. This new book has just been published and is available in Bookshop Santa Cruz and on line. As many of you know, I have been a contributor and active member of this project for many years now. and I will reply with more details as the date approaches. their stories and answer questions. Holly Harman, author of the related book “Inside a Hippie Commune,” will also be on hand. Signed copies of both books will be available. Also, a website of supplementary material is in preparation. And a facelift of our old website is also in the works thanks to Jacob Aman. It has been 50 years since Leon opened the Barn!!! One of the primary goals in conservation science is to inform policy makers and the general public on the state of biodiversity on this planet. This noble and lofty goal has been motivated by environmental studies documenting the harmful effects of humans on natural populations and ecosystems. Paradoxically, while we are documenting the loss of biodiversity on planet earth, the voices in conservation science lack human diversity. The Society for Conservation Biology has recognized this as a major weakness in our ability to generate and promote the best conservation science and environmental impact. In general, conservation science is not representative of our diverse society, and we are looking into ways to “fix the leaky pipeline”, and the many obstacles to wider diversity in our professional field. I won’t go into all of the details, but I highly recommend that anyone interested in diversity issues within the field of conservation and environmental sciences to go to this website: http://www.diversegreen.org, and read the summary report “The State of Diversity in Environmental Organizations: Mainstream NGOs, Foundations & Government Agencies” (http://vaipl.org/wp-content/uploads/2014/10/ExecutiveSummary-Diverse-Green.pdf). Recently, members of the Santa Cruz Chapter of the SCB, the Society for Advancement of Chicanos/Hispanics and Native Americans in Science (SACNAS), and the Doris Duke Conservation Scholars Program came together to discuss issues related to diversity and inclusion in conservation science. I approached the SCSCB to give a report on a diversity workshop I recently attended with the Smith Conservation Fellowship Program. The leadership within SCSCB were more than enthusiastic to have this discussion and organized a panel, which included Justin Cummings (Director, Doris Duke Program @ UCSC, http://conservationscholars.ucsc.edu/people/), Rolando Madrid (Director of Programs @ SACNAS, http://sacnas.org/about/who-we-are/staff), and yours truly (http://research.pbsci.ucsc.edu/eeb/bbhughes/). The three panelists provided an overview of their respective programs, which led into a round table discussion about diversity issues in conservation and exploring solutions. A lot of the discussion focused on the leaky pipeline, specifically, where are we losing diversity among the ranks in conservation? High school? Undergraduate? Graduate school? What are the cultural and societal barriers to a career in conservation for under represented groups? And more importantly, are there solutions? The group identified positive directions, but there is not a single solution to such a complex challenge. Some of the solutions discussed were actively mentoring students from underrepresented groups and helping to bridge gaps that prevent students from reaching leadership positions in conservation. The group collectively recognized that many minorities choose not to pursue conservation at the undergraduate and high school levels, emphasizing the importance of SACNAS and the Doris Duke Programs. SACNAS is a massive program (25,000 members) with the goal of advancing the careers of minorities in STEM, and organizes one of the only science conferences on the planet that features science by minority students and professionals. The Doris Duke Conservation Scholars program, funded by the Doris Duke Charitable Foundation, has been established at 5 universities in the United States (University of Washington, University of Florida, Northern Arizona University, University of Michigan, and University of California Santa Cruz) and seeks to prepare undergraduate students from underrepresented backgrounds to be future leaders in conservation. Scholars are introduced to conservation science and leadership through intensive training over two consecutive summers in the model of a paid internship. If there was a big take home message from the SCSCB meeting on diversity issues in conservation it was to keep the conversation going. Talk about it with your peers, supervisors, students, administrators, funders, families, etc. By creating conversation the issue will not go away and will more likely gain steam and go from conversation to actions to make the conservation community more diverse and inclusive. One simple step became clear, encourage your local SCB chapter or institution to adopt a diversity statement with stated goals. If your school or institution does not have diversity committee then start one. Encourage your school or institution to adopt mandatory diversity training for all employees. Hi, there. I’d like to introduce myself to you all. My name is Devii Rao and I’m the new University of California Cooperative Extension (UCCE) Livestock and Natural Resources Advisor for Santa Cruz, San Benito, and Monterey Counties. These are some of the most beautiful counties in the state, so I feel incredibly lucky to be starting my research and education program here. The focus of my research is on livestock and range management practices that maximize production efficiency and also enhance rangeland resources, wildlife habitat, and water quality. 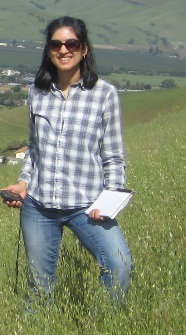 My primary avenues for education and outreach are through organizing and speaking at workshops, and through my blog: http://ucanr.edu/blogs/LNRBlog/index.cfm. I’ve been working with UCCE for just over a year now. During that time, I identified grassland plots where I will measure annual herbaceous forage production; began a research project on different control methods for Russian thistle, also known as tumbleweed (Salsola sp. ); provided guidance to agencies on their livestock grazing programs; developed a blog; and organized multiple educational workshops. This year I’ll be putting together workshops on low-stress livestock handling, livestock health, and rangeland weed management. If you have any questions about how to manage our local rangelands to benefit water quality, native plants or wildlife while maintaining economically viable ranching operations, feel free to get in touch with me. Maybe we can start a research project together! All six of the island’s mammals are just keeping dry today, poorly adapted to island life, maybe we’re not meant to be here… The thousands of avian and reptilian vertebrate residents are probably just as happy to have drenching rain and 30 knot gusts as calm sunshine, but it tends to throw a slight kink into our well oiled seabird research machine. Last night we checked the radar maps to see a large red/pink (meaning hellish) blob of weather headed our way. To affirm our tough reputation as seabird biologists, we spent a few hours in the rain looking for storm-petrel burrows, and looking for petrels but before long we were thoroughly drenched and our fearless leader Chris declared that the following day would be a “Scones Day”, one bit of kiwi English that needed no translation. Be it offshore i slands in California or New Zealand, days like this aren’t fit for much other than baking, staying indoors, editing photos and writing. With any luck the storm should blow over by the end of today, leaving us with a few nice days for the rest of our trip. If I look around the bunkhouse, or “bach”, I could be on almost any island’s research station. There are walls littered with various old maps, photos and biological curiosities; a pile of seabird carcasses by the door, many more spread wings and feathers in the entranceway, dilapidated furniture, more ba ttery chargers than I can count, and importantly lots and lots of high calorie foods. 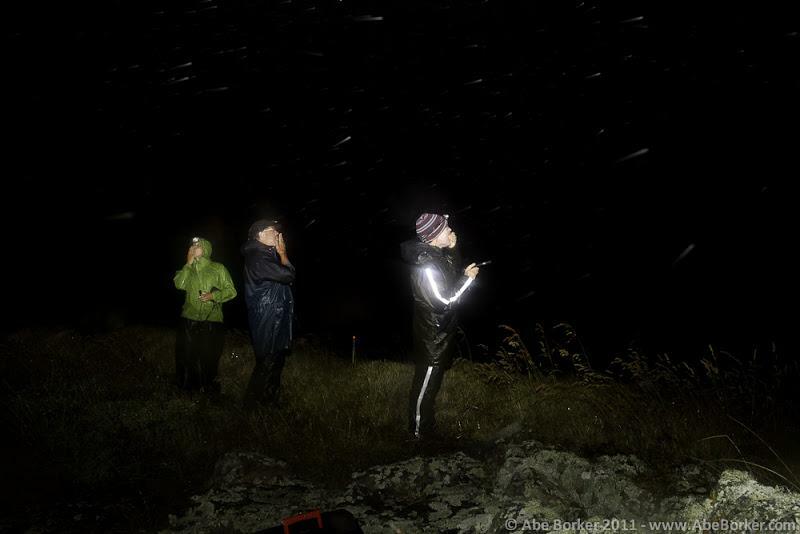 While indoors, it can look a lot like the Farallones, outside at night presents a far different seabird soundscape. 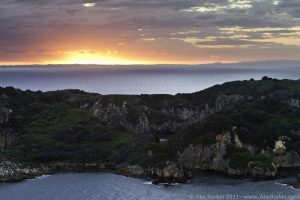 Just down the lighthouse path are Fluttering and Little Shearwater burrows deep in the vegetation, and if one walks a little farther, White-faced Storm-Petrels and Black Winged Petrels have turned the ground into swiss cheese. Hobbling around the ground like bizarro Cassin’s Auklets are Common Diving-petrels, and you must be super careful not to accidently step on the grass tussocks that seem alive with calls. 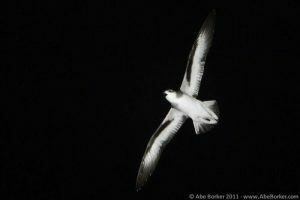 There are a few burrows you could lose a leg in, and those belong to the Grey Faced Petrels I’m yet to see, but maybe I can find my vagrant friend from Monterey Bay one of these nights. Lastly, while confined to the lower slopes, I’d be a fool to forget the foul smelling, foul sounding Blue Penguins. A real good Kiwi seabird biologist already could tell you where I am by species assemblage, but for the rest; we’re camped out on Burgess Island in the Mokohinau Islands. Why am I here? If you’re interested in protecting threatened seabirds, New Zealand is the place to be. 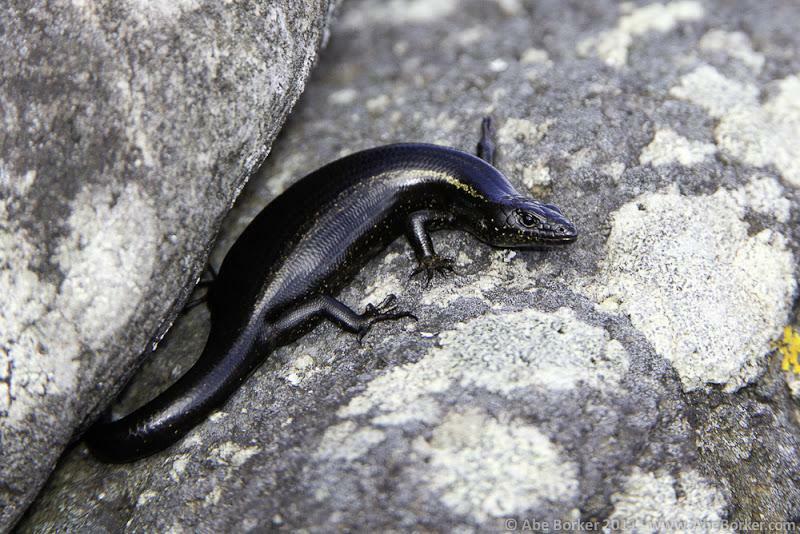 Despite it being smaller in area than California, it has over 30 threatened breeding species. Evaluating the population trends, and evaluating the outcomes of conservation actions here is important to saving these species. 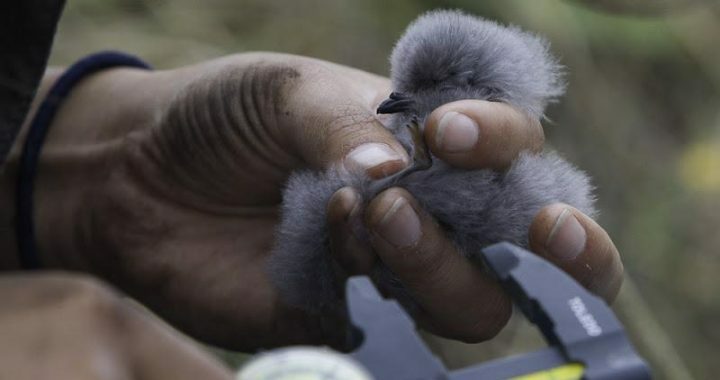 In fact, some of the most cost-effective actions to protect seabirds in our local marine environment depend on protecting breeding habitat halfway around the world. Thankfully New Zealanders have led the way in island scale restoration, Burgess Island was one of the first islands in New Zealand to have it’s rodents removed by the Dep artment of Conservation in 1990, and the island now thrives, rodent free for over a quarter century. 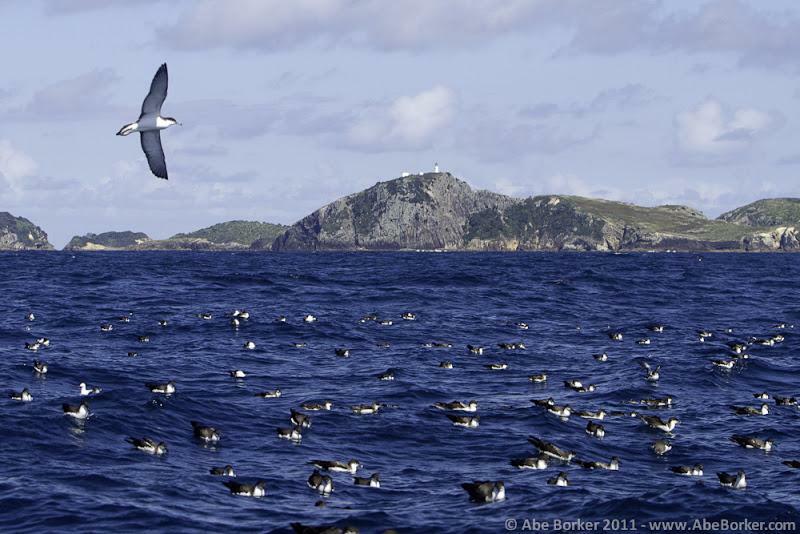 Today these islands support at least 12 breeding species of seabirds (including 7 procellarids! 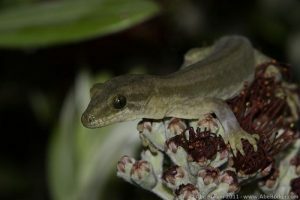 ), endemic skinks, geckos and surely even more invertebrate and plant biodiversity than us bird-centric folks give credit to. I’m here with five other scientists to investigate how seabirds are faring out here, where they go and what they do. My own interest is tes ting acoustic monitoring approaches to measure the diversity and abundance of these remote colonies. The nights out here are overwhelming as tens of thousands of birds descend and release all sorts of primitive sounds into the night. 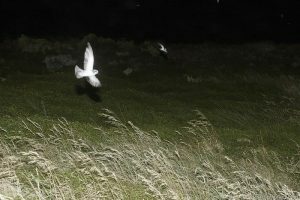 By contrast, even at the species rich Farallones, nighttime acoustic activity is generally restricted to four or five species of seabirds, while recordings here might have twice as many species vocalizing over the course of a single night. 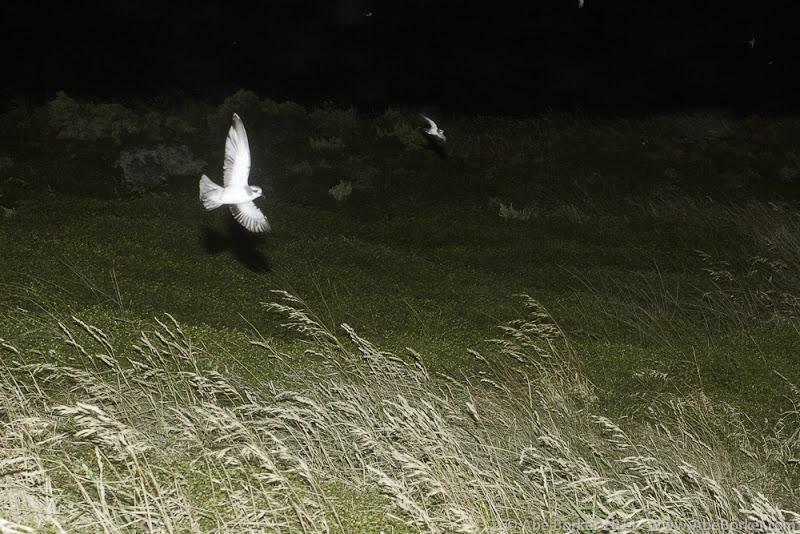 Both are a far cry from the single species tern colonies I started working in three yea rs ago! Why research the effectiveness of acoustic monitoring out here? For every accessible island like Burgess, there are many more so remote, fragile or dangerous to visit that we don’t know much about the island’s seabirds. 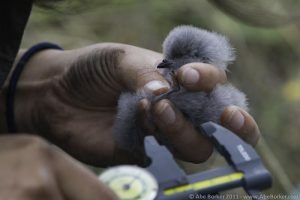 Even on Burgess, we work in only a fraction of the seabird breeding habitat for a few months a year. 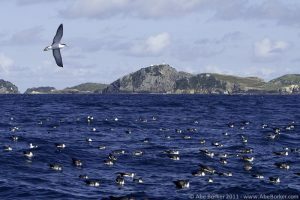 Island scale information on the diversity and abundance of cryptic seabirds, is critical to evaluating conservation actions and management. 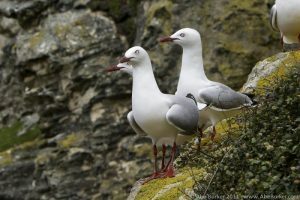 In a country like New Zealand with so many endangered seabirds, and relatively few people and resources, there’s a strong desire to embrace scalable tools for population monitoring like acoustics. The trip out here was simple enough, a 3 hour ride out here through lumpy seas and windy weather, huddled behind the cabin, staying moderately dry, with an occasional glimpse of a prion or shearwater through the boat spray. After unloading what seemed like a mountain of gear with two dinghies, and seeing off the five biologists hopping off the island, we set about our work. The first chore was getting everything from the beach to the “bach” (bunkhouse) about 305 vertical feet above us on the tippy top of Burgess Island. After a couple of exhausting trips up and down,we settled in and unpacked human fuel (food), island fuel (petrol), and field gear. We were just in time to watch the air force practice a supply drop (just some practice for them). One package of lemonade ended up “in the drink”. 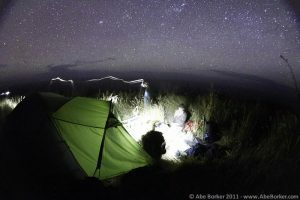 Thankfully the package with beer and rocky road settled in just a few meters from the precipice. 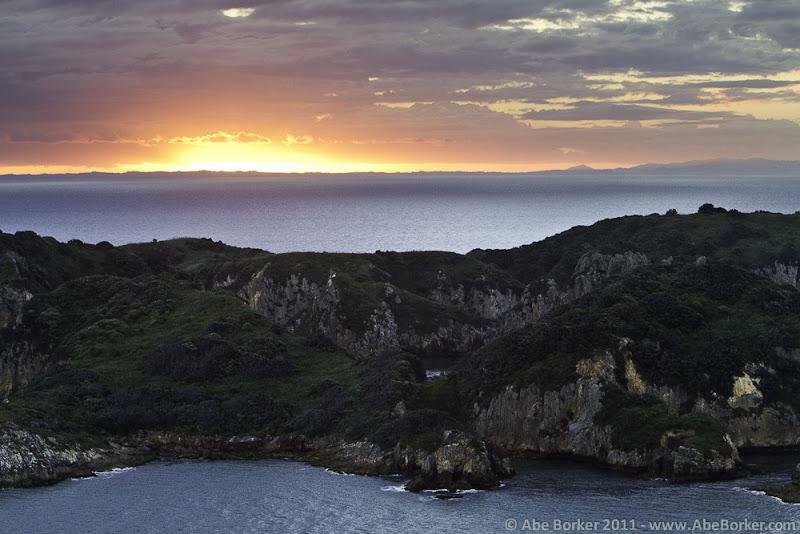 I got to tour the north headland looking for the lost supply package, but we reckon it’s a goner. When I returned Derek had already fixed up dinner, mince meat and sautéed veggies. Well fed we were ready to check out the night time visitors. One step out the door and we heard could hear petrels calling overhead, and after walking a few hundred meters we already encountered five species of tubenoses! Black-winged Petrels and White-faced Storm-petrels buzzed our heads as we stood on the ridge. My colleagues began “War-whooping”, an improbable but incredibly effective solution to getting a wild bird to land squarely at your feet. It was an incredible introduction to the island, and I slept well, fully “knackered” from the trips up and down from the beach. 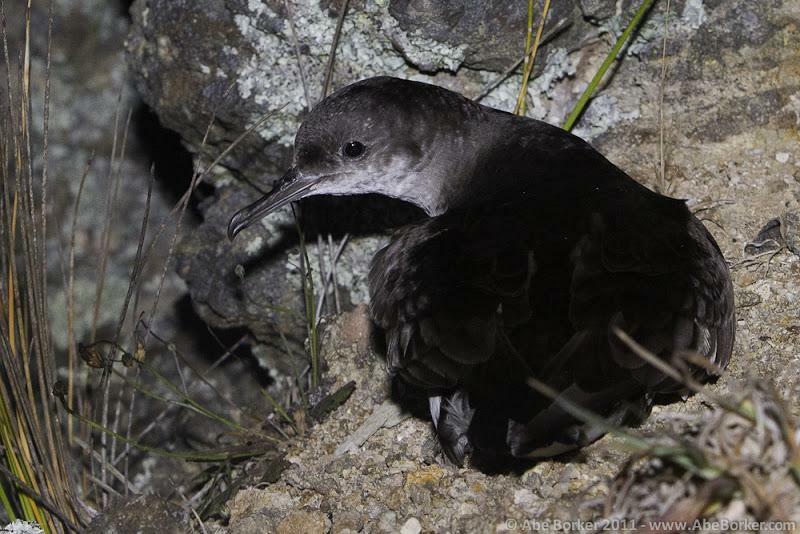 That night I’d like to say I dreamed of what other birds the island would hold ov er the next week, perhaps the elusive New Zealand Storm-petrel, but I was probably out like a light on a healthy portion of air dropped rocky road and Heineken courtesy of the New Zealand Air Force. Join SCSCB for a panel discussion about how best to advance diverse interests and voices in the field of conservation! Our panelists have extended experience in issues in conservation biology, social justice, diversity in higher education, and community organizing. The event is free and open to the public. Stay afterward for a potluck at the Long Marine Lab to get to know our members and learn what SCSCB is all about! This past Saturday, SCSCB joined its fellow chapters at Stanford and Berkeley at the 17th annual Bay Area Conservation Biology Symposium. The event was full of fantastic talks, with topics including bee diversity in agricultural systems, drought mitigation plans, consequences of Sudden Oak Death, and impacts of bullfrogs on the California red-legged frog. We learned about the multitude of ways that humans impact wild systems in the Bay Area and around the globe through habitat modification, alteration of fire regimes, contributions to invasive species spread, and behavioral changes in wildlife. We heard from very distinguished conservationists and ecologists John Terborgh, Michelle Marvier, and Peter Kareiva in the keynote addresses. Dr. Terborgh shared his lifetime of work on the importance of preserving top predators in ecosystems, and Drs. Marvier and Kareiva explored the path to increasing national support for conservation and including more diverse voices in our field. Officers of SCSCB also presented two talks at the symposium. SCSCB vice president Abe Borker presented his dissertation work on developing monitoring strategies for seabird colonies using soundscape recording. SCSCB president Justine Smith presented her work using citizen science and genomics to understand how human disturbances impact mesocarnivore diet and competition. We are glad to be a part of this productive conservation community here in the Bay Area! If you are interested in learning more about this event or would like to help us host next year’s symposium, please email us at scscb.host@gmail.com.